These destinations are great for San Francisco or San Jose area Boy Scout Troops looking to do a practice hike or an overnight backpacking trip. Mt Diablo – There are some great campsites for Scouts on Mt. Diablo. A favorite for large groups is BBQ Terrace, partly because the Scouts can pitch their tents up by the horse tethers and the adults can stay down by the parking area, giving each group plenty of space. There is also a nice walk down to Rock City and a good hike to the top of the mountain. Briones has miles of good backing with access from multiple locations. Briones Regional Park The Maud Campsite has a large covered campfire area in case it rains. Wa-Ta-Chi camp is also great. You have to walk into these campsites, although sometimes the Rangers will let you drive in and unload if the conditions are right. Briones Regional Park’s three group camping areas–Wee-Ta-Chi, Maud Whalen, and Homestead Valley-may be reserved by calling 1-888-EBPARKS or 1-888-327-2757, press option 2, then 1, or by writing to EBRPD Reservations, 2950 Peralta Oaks Court, P.O. Box 5381, Oakland, CA 94605-0381. Reservations must be made at least 7 days in advance. Read about Scouts in Action at Briones. Las Trampas near Danville is a popular area for day hikes. (There are no campsites.) Drive to the end of Bollinger and you will find several trailheads and there are usually maps available. There are many other trailheads on the west side on HWY 680. .
Sunol Regional Wilderness has many trails and fun things to do, especially for younger boys. The Indian Joe Caves and Little Yosemite are common destinations for day hikes. Great campsites, including a group site right next to the parking lot. If you are in the mood for a real workout, hike into Maggie’s Half Acre site neat Mt. Rose. Its accessible from Del Valle or Sunol. About 20 miles to get there and back no matter where you start or finish. Bring lots of water because there is none on the trail. Reserve campsites in Sunol: 1-888-EBPARKS or 1-888-327-2757, press option 2, then 1. Black Diamond Mines near Antioch takes hikers past abandoned mines. You can even get a tour if the headquarters is open. Be warned that there are few trees and on hot summer days it can be an exhausting exerpience. Bring lots of water. There is one backpackers campsite. Reserve it by calling 1-888-EBPARKS or 1-888-327-2757, press option 2, then 1. Morgan Territorynear Antioch offers lots of trails to the top of Mt. Diablo or through the surrounding hills. Some parts are pretty rugged and slipping on steep fire roads is not uncommon. 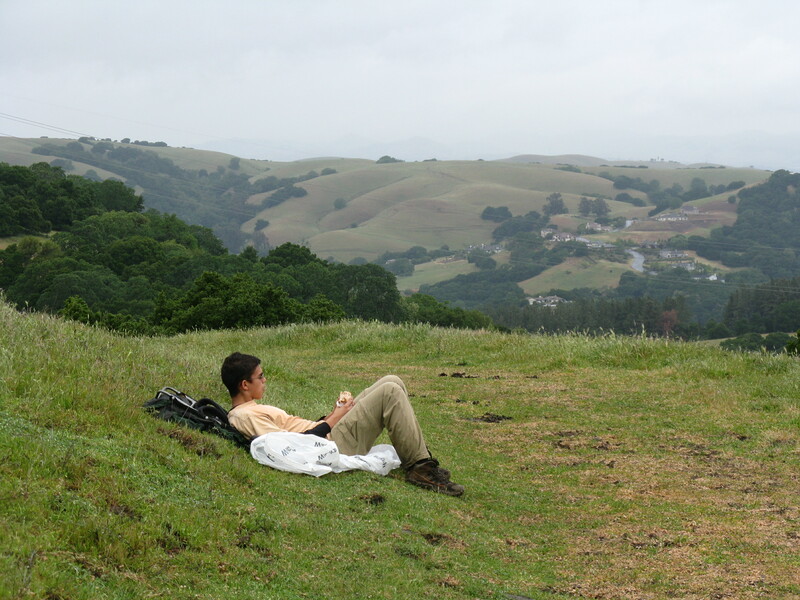 You can reserve the Morgan Territory Backpacker campsite through East Bay Parks. (This campsite is primitive and the water has to be filtered.) Compared to popular hiking places like Mt. Diablo and Las Trampas, Morgan Territory is almost empty. Henry Coe State Park near Morgan Hill. The largest State Park in Northen California with hundreds of miles of trails and lots of backpackers campsites that are first come – first serve. (They almost never fill up and even if they do, you can have a wildnerness camp in most parts of the park.) Always check to make sure there is water in late Summer and Fall. Drivers – take 101 south to East Dunne Avenue then go east and follow the signs. Its takes about 30 minutes from 101 to the Park Headquarters. The RIM OF THE BAY program was developed to encourage hiking by Scout Troops, Webelo Dens, and Cub Packs in Northern California. There are six Mountains that make up this series. Every time you climb a mountain, you earn the patch and a rocker. Patches can be purchased at the MDSC or SFBAC Scout Shops. Any of these trips can be completed in a single day. Most “peaks” have multiple trails to the top, so you can vary the experience depending upon the skill of the hikers. They make a great Patrol outing. For more details, including driving instructions, follow this link to the SFBAC website. Your turn. What are your favorite trails in the East Bay? Azimuths? using a spotting scope and a compass, my Scouts learned to find their neighborhoods in Antioch and Pittsburg and using a map, plot out the back-Azimuth to their position. One of my Scouts, who graduated from the Citadel and became a Marine Corps 2nd Lt knew more about land navigation from Scouting than his classmates at Basic School in Quantico ,VA. He emailed me and said he was stunned by all of the outdoor lore he learned in Scouting was so useful as a new officer in the Marines. That was a win! You can create a near 50 mile trip by hiking from Contra Loma to either two of the Black Diamond campsites. The next day, a long day, hike to Clayton, perhaps having a lunch in town, and hike up to the Juniper campground. Take a layover day at Juniper-hiking to the summit and having a support driver bring in fresh food and firewood for a campfire (if authorized). The following day hike to Round Valley. Hike out and meet parent transportation at Marsh Creek Road. Thanks for sharing your story on 50miler.com. Sounds like great memories for your Scouts. I was wondering, what is an “azimuths” that you mention? When I was a Scoutmaster in Antioch, hiking up Mt. Diablo in January from Mitchell Canyon was my new addition to our outing schedule. We’d be dropped off and hike up the hill with real simple loads-bag, pad, tarp, water bottle, warm clothes, spoon, Sierra Cup, We’d make a quick camp at Juniper, dump our packs and head up to the Observatory on the summit. One of the dads would haul up some firewood in a truck, plus dinner, breakfast, and next day lunch materials. After dinner, we’d have a warm campfire/cocoa as the temps would drop. We’d get in the bags and sleep sound. No bugs. Hike down in the morning to be picked up. On Mt. diablo, we use Juniper campsite during the fall; there’s usually no problem getting a reservation, it’s nice and cool up that high. There are water points all over, and the campsites are reasonably level. In Sept/Oct/Nov, there are often hang gliders jumping off the side of the mountain at the Juniper parking area, and some of them are willing to chat with Boy Scouts. On Mt. Diablo, Wild Cat is a good group site, had about 24 Scouts camped overnight. There is running water available and pit toilets. Good rocks nearby to scamble and a short hike to Rock City. In early spring there are plenty of wildflowers in bloom. Make sure food is stored, there are many raccoons that come out at night. You can hear coyotes at night when the moon is out.